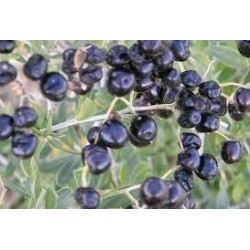 A relative of the popular goji berry, this black fruited species bears small, berry-like fruits. Fruits are lesser known than the standard goji, but are popular in China for a number of alleged medicinal and nutritional benefits. When used to make teas, the fruits turn the liquid into a beautiful dark blue color. Small shrub, drought tolerant, likely freeze hardy in some zones. Native to portions of Southern Russia, through China and Pakistan. Lycium Ruthenicum - Black Goji There are 2 products.